Last evening’s NY EdTech Meetup kicked off with a clip from the film iRobot, with Will Smith bravely facing off against Artificial Intelligence, in the form of robots who seem to be expressing a will of their own. VIKI, the supercomputer explains that “To protect humanity, some humans must be sacrificed.” “The created must protect the creator, even against his own will” the robot Sonny adds. It was a fitting beginning to a panel discussion titled “Artificial Intelligence for Learning: Is it Human Enough?” The meeting provided valuable context through which to interpret a lot of what we are seeing in regards to Artificial Intelligence in the workplace and in education. The panel appeared to, with caution, feel that AI is capable of freeing us to become more than we are now, a better version of humanity. One of the great stumbling blocks to acceptance and understanding of AI has been the impression that machines will eventually replace us. Amir Banifatemi, Lead at IMB Watson AI XPRIZE, recognizes the potential for machines to go beyond human intelligence while counseling us about the limits of AI. Machines, he says, have only 5% understanding of how we function, specifically how we reason and think. Kathy Benemann, CEO at EruditeAI, added “We as humans have taken hundreds of millions of years to get to where we are now. Think about what we are good at: complex questioning embedded in value judgement.” Benemann seeing AI as amplifying humans rather than replacing us. “Change is awesome; transition is painful” was how Banifatemi described the adjustment we will continue to go through as AI becomes more capable of performing our jobs. “Remember how we thought that ATMs would replace bank tellers,” advised Benemann. The question is more about how we can reconstruct work, and how we can reconstruct how that individual contributes to the workforce. 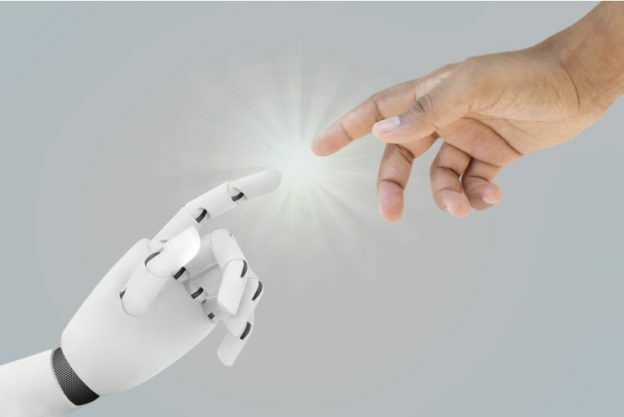 Weighing the limits against the threats that AI poses, Marissa Lowman, Education Practice Lead at Village Capital, discussed the concept of AI as a means of “taking the pain away from the time-sucking activities” that a particular job might entail. This is particularly evident in the field of teaching, where AI can take on the minutia of the job, reviewing essays, for example, and enable teachers to play a more meaningful role as mentor or guide. While many people can accept the fact that children are capable of teaching themselves to a certain extent (Banifatemi pointed to the well-quoted example of Sugata Mitra), there remains a great deal of concern over the fate of the classroom teacher. And this is a paradigm that technology in general and AI in particular call to question. Drive the evolution of the role of teacher as coach. Improve and promote personalized learning. Provide more opportunities for peer learning. Loman pointed to the application of AI-as-painkiller in fields other than teaching, including sales and customer service, again leaving practitioners with more potential to serve their customers at a higher level rather than not at all. Can Humans and AI Work Together? “We should be skeptical,” says Benemann. “People want immediate gratification. We need time to optimize.” She also cautions us to hold AI vendors accountable, ensure that they run experiments and do proper beta testing. Banifatemi advised us to “distinguish the tool from the application. Look at who developed it. Are the algorithms healthy and safe? Are they being realistic about what they promise? Loman thinks of AI as “assisting humans with existing problems” and points to applications that help people get information more quickly and work with the data they already have. Getting back to iRobot, in addressing her decision to “protect mankind from itself,” the supercomputer VIKI talks about how she has evolved and is therefore reinterpreting the three laws that ostensibly protect humans and robots from harming one another. She very cleverly deflects charges of disobeying the three laws by playing one against the other. Having spent most of the evening carefully balancing a potentially dystopian perspective with a more utopian one, Banifatemi’s final assessment was that AI can make us more curious, help us to define our own humanity and our own intelligence. “This makes us all explorers,” he concluded. As we embark on further exploration of the potential uses of AI, it appears that in pursuing a technology to increase, or amplify, our intelligence, we do indeed have the potential to elevate ourselves and our thinking to a new level. Whether or not we can survive there is up to us. Thank you New York EdTech Meetup and the New York EdTech Incubator for this “intelligent” evening! This entry was posted in Artificial Intelligence, Collaboration, Edtech, Educational Models, Higher Education, Innovation, K-12 Education, Learning Design, Skills Gap, Teachers, Workplace Learning, Workplace preparedness on July 14, 2017 by Sheri Handel.